Supermarkets which have the most sensitive position towards income of population felt the first signs of economy improvement in Spain and are preparing for growing demand. Opening of new supermarkets is a great opportunity for investors. The supermarket sector, which is known to be very sensitive towards the income of a population, was among the first markets to feel the first signs of economic improvement in Spain and is preparing for a growing demand. All leading supermarket chains in Spain have planned for the increase of trade points in strategically important locations for the near future. The opening of new supermarkets is a great opportunity for investors. The economic model of hyper- and supermarket business in Spain implies not owning but renting spaces. Today, such chains as Mercadona, Caprabo, and Lidl are the most reliable leaseholders of trade spaces, signing contracts with a guarantee of 20 years. Investment in supermarkets in Spain is one of the most reliable ones. Rental contracts with supermarkets are one of the most profitable on the real estate market and can bring the owner from 6% till 9% per year. So far in 2014, the most demanded supermarkets are Mercadona and Caprabo in Barcelona and its suburbs. Income of local population is significantly higher than in other parts of Spain and that allows trade chains to look positively toward the future. Some of the advantageous offers may not be presented in our on-line catalogue of investment objects in Spain due to restrictions imposed by owners. In case if you are willing to get full information about all supermarkets for sale in Barcelona and its suburbs, you can contact us per telephone: +34 93 200 73 07 or via email info@albertgood.com. The Mercadona supermarket chain has the leading market share among all Spanish supermarkets. 21% of its shares belong to purchase of food items, domestic products, animal food and baby products in Spain. This number has increased by 1,3% in comparison with the previous year according to data provided by Worldpanel 2013 and Kantar Worldpanel. Mercadona has 1,411 shops all over Spain, 60 of which were opened in the last year. 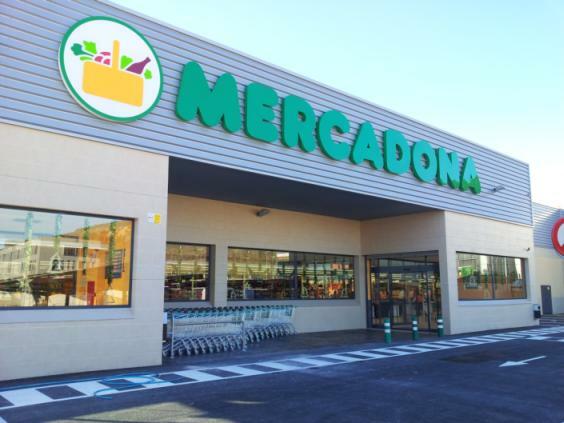 Mercadona is planning to broaden its geographical position by opening its first supermarket in Basque Country, at the end of 2014 or the beginning of 2015. Afterwards, they are planning to open an additional 24 supermarkets. After opening the first supermarket in Navarra in January 2013, Mercadona is planning to open 20 more in that area. Expansion in Catalonia is also underway, particularly with new shops opening in Barcelona and other big cities. The next largest supermarket chain after Mercadona is the Group Dia with a market share of 8%. Currently, Grupo Dia has around 7,000 trade points which are spread over Spain, France, Portugal (with the name Minipreço), Argentina, Brazil and China. In Spain there are 2,766 trade points of Rupo DIA, 1,005 of which are franchisers, making Grupo Dia a leader in franchising. Hypermarkets Carrefour are ranked third in Spain with a market share of 7,6%. Carrefour is a multinational French chain concentrated in three markets: Europe, Asia and Latin America. In Spain there are around 500 points of sale. In 2014 the group will start expending in African countries like Nigeria, Congo, Senegal, Ghana, Gabon, Cameroun and so on. Meanwhile, the market share of Eroski supermarkets (the group includes supermarkets Caprabo) has decreased and stopped at 3,4%. The Eroski supermarket has 1,581 points of sale in the sector of food items which include: 1,467 supermarkets, 95 hypermarkets and 19 shops «Cash and Carry». The third segment of the supermarket chain is a franchise. Eroski occupies the leading position in the sector of retail trade in the following markets: the Basque country, Navarra, Galicia, Catalonia and Balearic islands. Caprabo supermarkets belong to the high segment of the market, which is why they are concentrated in the more wealthy districts of Spain – Barcelona and its suburbs. Hypermarket Alcampo takes the fifth place occupying 3% of the market share. Alcamo represents the Auchan Group in Spain. At the moment it has 55 hypermarkets in Spain in 14 of it autonomous areas. Lastly, Lidl supermarkets maintain its position with a 2,9% market share. Lidl took its niche on the Spanish market in 1994 when opening the first shop in the town Lerida (Catalonia). Since the opening of their first shop, their sale points have been growing. Currently, Lidl has more than 530 shops all around Spain. Despite its leading position in owning market share in Spain, the Mercadona supermarket chain takes third place in terms of the number of opened points of sale (1411). The leading position belongs to GrupoDia with 2,766 points of sale followed by Eroski, the fourth place belongs to Lidl (more than 530), the fifth to Carrefour – around 500 and the last place is taken by Alcampo (55 hypermarkets).